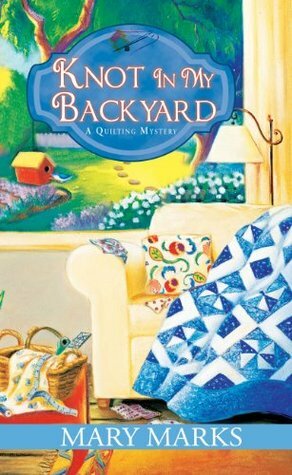 Baseball may be America’s official favorite pastime, but for Martha Rose and her friends, quilting is far more fun…and a lot less dangerous. I liked Martha Rose the minute I met her in Forget Me Knot, the first book in this series. I can relate because I am 50ish, overweight, love food, hate to cook and a horrible failure when it comes to dieting. This time she gets herself in trouble just by taking a walk. She knows she needs to be more active but finding a dead body just a few minutes from her house may make her reconsider the whole exercise thing. The police of course determine that Martha’s neighbor is the killer because he had an argument with the victim over a monstrosity of a baseball diamond that was built behind their houses. None of the neighbors is happy about all the extra traffic or the noise but Martha knows none of them would commit murder because of it. With a little help from her friends Lucy and Birdie they come up with enough suspects to fill a baseball roster. Martha Rose is on a mission and detective Beavers is not going to stop her from finding who really hit Dax Martin out of the park – permanently! The book was so much fun to read. Martha, Lucy and Birdie have their weekly quilting sessions where they talk about everything from quilt squares to politics to the homeless population in their neighborhood. They come up with a fantastic plan to not only help people but a way to hopefully flush out the killer and they get all kinds of attention. Martha even makes a new friend that sort of turns her life upside down in a really good way. Fabulous characters, excellent plot and subplots, some romance, the perfect amount of humor and a setting that is so easy to picture all add up to a grand slam of a mystery. I absolutely loved it! Find out more on Mary’s webpage here. Sounds good to me, thanks for the chance to win. Thanks Lori for the review! This is a new-to-me author and series. I need to play catch up and read the debut. Thank you for a chance to win this one. Spotlight/Giveaway – Snow White Read Handed by Maia Chance Cozy Wednesday with Diane Vallere – Author of Suede to Rest – Giveaway too!